MSNBC's Thomas Roberts reports on a train derailment in Baltimore County, MD., that sparked a huge fire. A huge fire outside Baltimore, triggered by the collision of a freight train carrying chemicals and a trash truck, raged for 10 hours before being brought under control, officials said early Wednesday. A dark, thick plume of smoke could be seen for miles after two of 15 derailed cars from a CSX-owned train caught fire. The blazing cars were carrying terephthalic acid and fluoroacetic acid, which Baltimore County Fire Chief John Hohman said are not toxic inhalants. However, residents were encouraged to avoid excessive exposure to the smoke. A fire burns at the site of a CSX freight train derailment Tuesday in White Marsh, Md. The only person injured in the accident was the driver of the truck, John J. Alban, Jr., 50, who is in serious but stable condition, Baltimore County Executive Kevin Kamenetz told NBC affiliate WBAL. Two CSX employees on the train were not injured, according to authorities. The fire, which began at about 2 p.m. Tuesday, was finally declared to be under control at 11:41 p.m. according to Capt. Bruce Schultz of the Baltimore County Office of the Fire Marshal. He said officers were maintaining a fire watch to monitor any flare-ups or hot spots. The blast could be felt for miles, and many area residents said they initially thought they were experiencing an earthquake. Witnesses told WBAL that windows were blown out from nearby homes and businesses. Rosedale resident Elaine Smith told WBAL she felt an explosion. "I really was scared," she said. "I've never seen a cloud like that in my life." The crash occurred in a mostly industrial section of Rosedale along U.S. 40, in the 7500 block of Lake Drive. The train was moving southbound when it collided with a waste-hauling truck. The train continued moving for several hundred feet before 15 cars derailed. An explosion quickly followed, sending a huge cloud of black smoke into the air. Alban is a retired firefighter with the Baltimore County Fire Department, as well as a volunteer at the Hyde Park Volunteer Fire Co, fire officials told reporters. 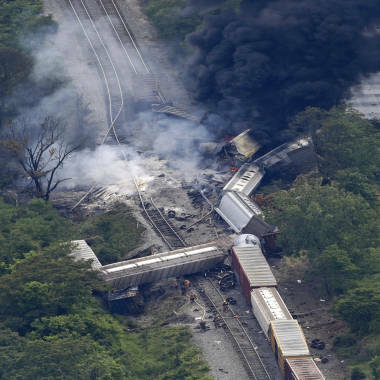 A National Transportation Safety Board team, led by Robert Sumwalt, will investigate the derailment.